Edge Hills Provincial Park protects panoramic river canyon vistas, gentle forested slopes, and grassy benchlands and ravines on the eastern slope of the Fraser River. Such a diverse landscape provides habitat for a wide range of wildlife species. The protection of wildlife and their habitats is a critical element in the management of this wilderness park. The area also protects cultural heritage sites. Backcountry recreation opportunities offering spectacular views include hiking, horseback riding and wildlife viewing. Edge Hills is an undeveloped wilderness park with no facilities except a network of unmaintained and unmarked trails. Nearby parks offering vehicle access camping include Big Bar Lake, Downing, and Green Lake Provincial Parks. Backcountry hikers should be aware that this is a wilderness area, and no supplies or facilities are provided. Suitable clothing should be worn and proper equipment should be used. Visitors should have appropriate maps. Anyone planning to hike overnight or longer should inform a responsible person of their intentions, and should provide estimated departure and return times. BC Parks does not provide rescue services. Visitors should be aware that there is no potable water in the park. Visitors must bring an ample supply of water, and should boil or filter water before use to avoid parasites. Edge Hills is an undeveloped wilderness park with no facilities. There is non-motorized access of unmaintained and unmarked trails to view and access grasslands. Nearby parks offering overnight facilities include Big Bar Lake, Downing, and Green Lake Provincial Parks. The park is located approximately 170 km south of Williams Lake in south central BC. 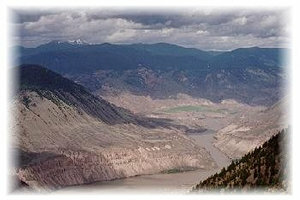 It is situated just west of Clinton, and north of Lillooet. The park can be accessed via Kelly Lake Road off Highway 97. It is adjacent to Marble Range Provincial Park; the Jesmond Road corridor separates the two parks. The closest communities, towns and cities are Clinton, 100 Mile House and Ashcroft. Two roads access Edge Hills Provincial Park. The High Bar Road enters from Jesmond Road. Some sections of this road are rough and steep, and four-wheel drive vehicles are essential in wet weather. Visitor use of this road is not recommended beyond the lookout at Cougar Point because the road is extremely steep beyond this point. The Cavanagh Creek Road enters from Pear Lake, and is extremely rough, providing only limited motorized access to the height of land. There is no public motorized access beyond this point. ATV, motorcycle, and snowmobile use is prohibited on this road and beyond, except under permit. Off-road driving in any type of motor vehicle is prohibited at Edge Hills Park. Grasslands are very susceptible to erosion as the delicate lichen crust that protects them can take over ten years to recover from the passage of even one vehicle. Topographical map numbers: 1:50,000 92P/4, 92I/13, and 92I/14 apply to the park. These are available from most map dealers and some outdoor gear retailers in BC. Forested wilderness, grassland ecosystems, varied wildlife and scenic grandeur are represented in these new protected areas. These parks are located southwest of Clinton and east of the Fraser Canyon. The approved Marble Range / Edge Hills Management Plan is available in PDF format. Because of the large size of the file, the plan is divided into eleven separate files for ease of access. Park roads are steep and rough, suitable for advanced mountain bike riders only. Bring lots of drinking water. Please do not ride off road, as grassland areas are very susceptible to erosion. Bicycles must keep to roadways. Bicycle helmets are mandatory in British Columbia. Trails are not maintained or sign-posted. Bring topographic maps and compass and know how to use them. Tell a responsible person of your destination and expected return time. For your own safety and the preservation of the park, obey posted signs and keep to designated trails. Shortcutting trails destroys plant life and soil structure. There are horseback riding opportunities at this park. Please minimize your impact on the fragile grassland ecosystem by staying on existing trails and roads. To avoid importing weeds to the park, you must use weed free pelleted feed rather than hay or grain. Wilderness, backcountry or walk-in camping is allowed, but no facilities are provided. Day trips are preferred because of lack of water in this park, and to reduce human impact on the environment.